Habib Ali Mubarak is a 32-year-old Bahraini from Jad Hafes. He was disappeared, tortured, and convicted in an unfair trial, and his wife and infant son were imprisoned and held for eight months following his arrest. He remains in Jau Prison. On 21 October 2014, officers in plain clothing and masks, officers from the Special Security Force Command (SSFC) in uniform, and officers from the National Security Agency (NSA) raided Habib’s home without a warrant. Habib was not present, and the officers told his family that if he did not surrender himself to the Criminal Investigations Directorate (CID), they would return and raid the house on a daily basis. The officers stated that they only wanted to question Mubarak on a “small issue” and that he would be permitted to return home immediately after questioning. Two days later, on 23 October 2014, Habib surrendered himself to the CID. Rather than a brief questioning, however, officers arrested and disappeared Mubarak for five days, during which they subjected him to torture. CID officers physically beat him on the face, abdomen, and back, and spit on him during interrogations. They also held him in an extremely cold room, which the inmates refer to as a “refrigerator,” and subjected him to electric shocks until he lost consciousness. Habib also reported that the officers treated him in a discriminatory manner, insulting his Shia beliefs and doctrine. On 27 October 2014, Mr. Mubarak called his wife and told her that he was being transferred to Dry Dock Detention Center, and asked her to bring clothing to Dry Dock. However, when his wife – Zahra AlSheikh, a human rights defender – arrived at Dry Dock, the officers arrested her to serve a prison sentence issued in January 2014 on charges of illegal assembly. With Zahra was their six-month old son, Hussein Habib Mubarak. Both mother and son were taken to the Isa Town Women’s Prison, where they were imprisoned until 19 July 2015. On 19 November 2015, Habib was convicted on a charge of arson in connection to a fire in Jad Hafes and sentenced to 15 years in prison. However, Habib was able to provide evidence that he was at a pharmacy purchasing milk during the fire. The judge did not allow this evidence to be presented at trial. This sentence was upheld on appeal in May 2016. In 2017, Habib began to complain that he was suffering from depression and anxiety. He asked for treatment, but the prison authorities have refused to provide this. In June 2018, Habib was rushed to the hospital when he suddenly collapsed in the prison. At the hospital, he learned that this was caused by high blood pressure. Bahrain’s treatment of Habib and his family is in violation of its treaty obligations and international law, including the International Covenant on Civil and Political Rights (ICESCR), the International Covenant on Civil and Political Rights (ICCPR), and the Convention Against Torture and Other Cruel, Inhuman or Degrading Treatment or Punishment (CAT). His detention without charge and subsequent conviction in an unfair trial in violation of Article 14 of the ICCPR, rendering his detention arbitrary under Article 9 of the ICCPR. The detention of Zahra was also arbitrary, as it was in violation of her right to freedom of expression and assembly in Articles 19 and 21 of the ICCPR. The refusal of the Bahraini authorities to provide Habib with medical care and treatment for his mental health are in violation of the right to health in Article 12 of the ICESCR. 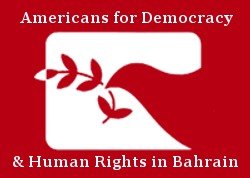 Americans for Democracy & Human Rights in Bahrain (ADHRB) calls on Bahrain to uphold these obligations by releasing Habib and annulling his conviction, and ensuring that any subsequent trial would be conducted consistently with international standards for fair trials. We also call upon the Bahraini authorities to investigate Habib’s claims of torture and hold the perpetrators responsible. Finally, we call on Bahrain, and particularly the authorities in Jau Prison, to immediately provide physical and mental health treatment to all prisoners in their care.